This latest production of The Heyeck Press continues the descriptive Bibliography of Marbling Projects begun in Marbling at The Heyeck Press. Adventures of a Marbler also contains five chapters on the pleasures and challenges, the unexpected adventures, of being a marbler. In 1913 Yagi, a successful Japanese marbler, dictated this book to a professor of a textile college in Kyoto so that his special suminigashi techniques would not be lost. Yagi describes colors, tools, water, chemicals and techniques for marbling both paper and silk. There are directions for creating twenty different suminagashi patterns. 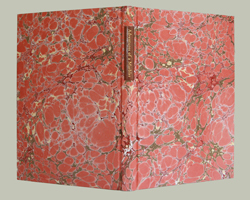 This book is bound in hand marbled silk. The handmade Twinrocker paper was made especially for this edition. The 16 point metal type is Centaur with Arrighi used for italics. A small printers flower has been printed in silver to replace colons in lists in the text. 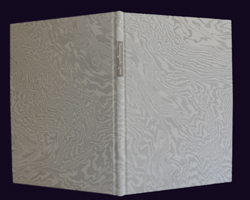 Three wood engravings by Rik Olson and twelve hand marbled samples by Robin Heyeck illustrate the book. The edition is limited to 200 copies. 28 x 20 cm.